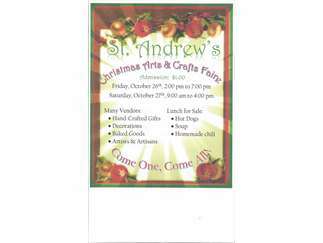 St. Andrews' Christmas Arts and Crafts Faire Friday, October 26 from 2pm - 4 pm and Saturday, October 27 from 9am - 4pm. Admission $1.00. There will be many vendors of hand-crafted items, baked goods, lunch will be available. This is a fund raising event for the church.